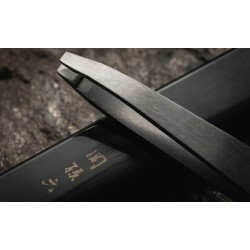 The SEKI MAGOROKU range comprises an exquisite and extensive collection of proven kai quality. The high-quality beauty accessories are used for a wide range of daily body care applications. The quality finish of the products ensures long-lasting sharpness for precise, individual and gentle grip. The robust SEKI MAGOROKU tools are also ideal and reliable travelling companions. Slant tweezers. Stainless steel, brushed with precisely adjusted top (9 x 95 mm).. Pointed tweezers. Stainless steel, brushed with precisely adjusted top (9 x 95 mm)..
Toenail Nippers. Stainless steel (68 x 120 mm)..
Toenail Nippers. Stainless steel (62 x 122 mm)..
Nail Clippers. Stainless steel, brushed, plastic incl. nail file and nail catcher (37 x 106 mm)..
Nostril Hair Cutter. Stainless steel (38 x 56 mm)..